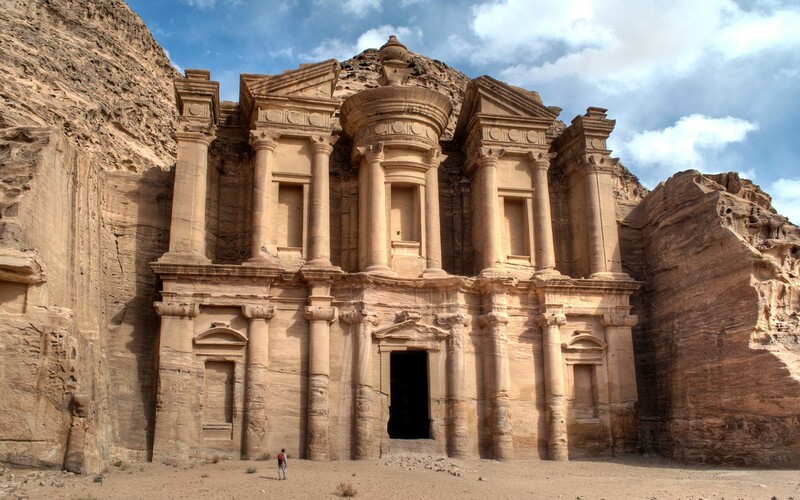 Visiting the ancient city of Petra is something that features on a lot of people’s bucket lists, and it’s easy to combine a visit with a trip to the Dead Sea and maybe the deserts of Wadi Rum or the beaches on the Red Sea coast all within a week’s holiday. But how much does it cost to visit Jordan? It has a reputation as being one of the more expensive countries in the region, but I found it was still doable on a budget. 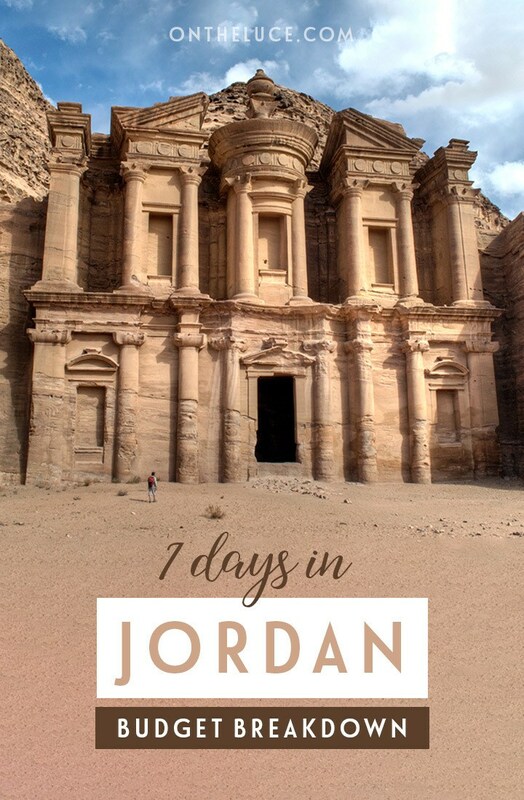 Here I share my trip budget for a week in Jordan. There’s a huge range of accommodation options in Jordan, from simple locally run guesthouses up to five-star international chains. And we stayed in both, starting off with two nights in Amman at the Le Grand Amman. Rooms normally cost about JD103/£110/$145 a night but I cashed in some Starwood points I’d won in a competition and got two nights for just £25. In Petra we stayed in the Rocky Mountain Hotel, a basic guesthouse on the hillside with million-dollar views. Our double room had a teeny en-suite shower room and only cost JD75/£80/$106 for three nights (JD12/£13/$18 per person per night). If you want to stay at the Dead Sea there’s nothing but huge five-star hotels so we splashed out for two nights at the Movenpick, which cost JD168/£180/$237 after a bit of shopping around (JD42/£45/$59 per person per night). 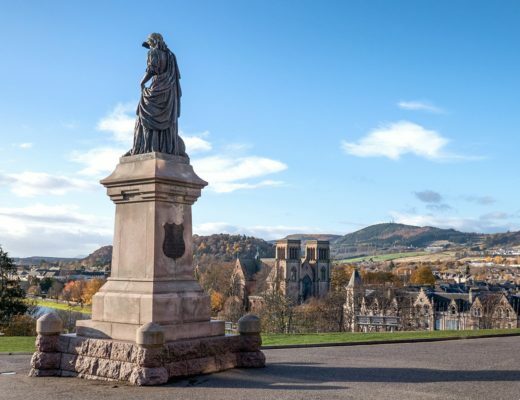 Total accommodation cost: £480/$633 or £240/$317 per person (not including the points discount) – an average of £34/$45 a day each. 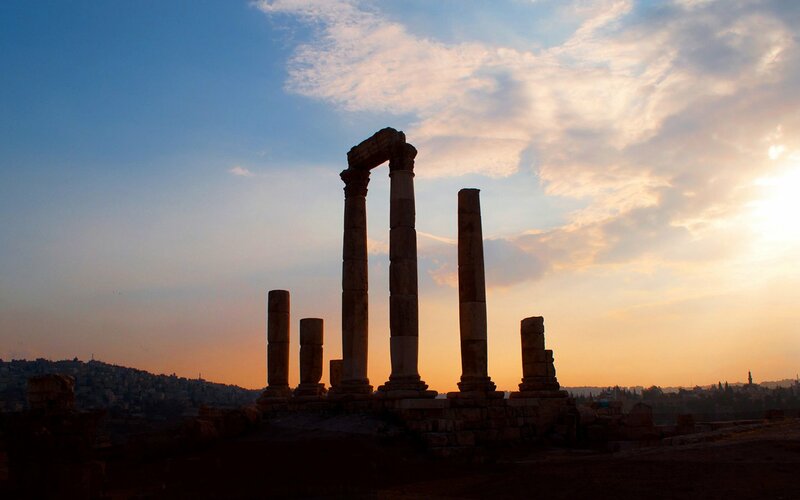 There are direct flights to Amman’s Queen Alia airport from the UK (from £350 return) as well as major cities around Europe and the Middle East. One of the cheapest ways to get there is to fly to Paphos in Cyprus where you can get a £27/$36 return Ryanair flight to Amman. We took taxis costing JD12/£13/$17 to and from the airport to Amman before picking up a hire car. We hired a small car for the week with Avis for JD147/£157/$207 (which was booked in advance from the UK). Petrol is fairly cheap in Jordan and the car was very efficient so we only spent JD28/£30/$40 on fuel, despite driving most of the way across the country. Total transport cost: £200/$264 or £100/$132 per person – £14/$19 a day each on average. The biggest activity costs are in Petra, where a two-day entry ticket to the ruins costs JD55/£58/$78 per person. It’s worth staying for a couple of days as there’s so much to see at the sight and a one-day ticket is only slightly cheaper at JD50. 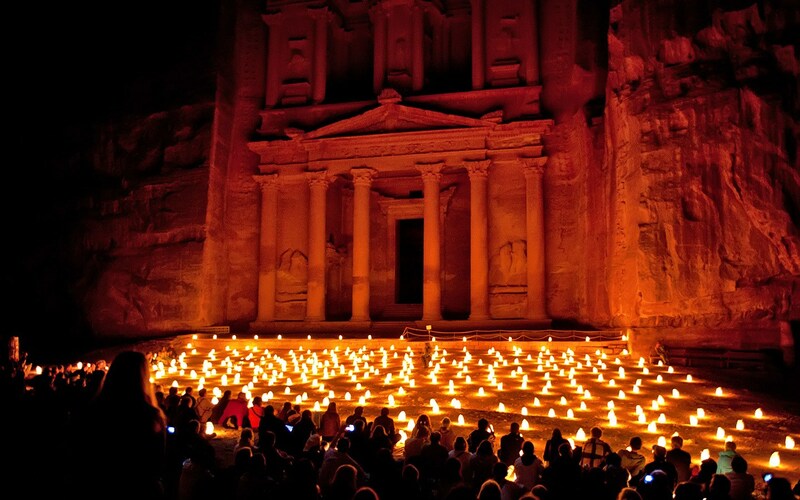 We also did the Petra by Night tour where the Siq is lit up by candlelight, which cost JD17/£18/$24 per person. Away from Petra, the only activity which we paid for was the entry to Amman Citadel, which cost JD2/£2/$3 per person. At the Dead Sea we did think about using the hotel’s spa (JD60/£64/$85), but as we only had a day there was enough to do with the beach and hotel pools. Total activities cost: £78/$105 per person – £11/$15 a day each on average. Breakfast was included at the Rocky Mountain hotel and the rest of the time we bought our own food. Lunch was normally a snack while we were out and about, and we bought various bottles of water and cold drinks, coming in at a total of JD64, or JD32/£34/$45 per person. Dinner prices varied hugely. At the Dead Sea you’re limited to five-star resorts so we paid JD18/£19/$25 per person for a main course and drink. Many of the big hotels do buffets, the Petra Movenpick’s version is decent value (and has an amazing dessert selection) at JD21/£22/$30. But check prices as the Dead Sea Movenpick’s similar buffet was JD10 more. Away from the big hotels we paid JD8/£9/$11 for a mezze meal in Petra and JD10/£11/$14 for a three-course set meal at the Rocky Mountain Hotel. In total we ate out for six evening meals, one lunch and a meal at the airport, coming in JD196 in total, or JD98/£105/$138 per person. A beer after a hot day exploring will eat into your budget in Jordan – alcohol is only available in Western-owned hotels and is heavily taxed. At the Dead Sea Movenpick it’s £11 for a half-litre of imported beer! We didn’t drink much and when we did we mainly stuck to local beers. We have a few drinks in the Cave Bar in Petra, and found the sunset happy hour at the Dead Sea with two-for-one on glasses of wine, coming in at a total of JD60, or JD30/£32/$42 per person. Total food and drink cost: £342/$450 or £171/$225 per person – £24/$32 a day each on average. 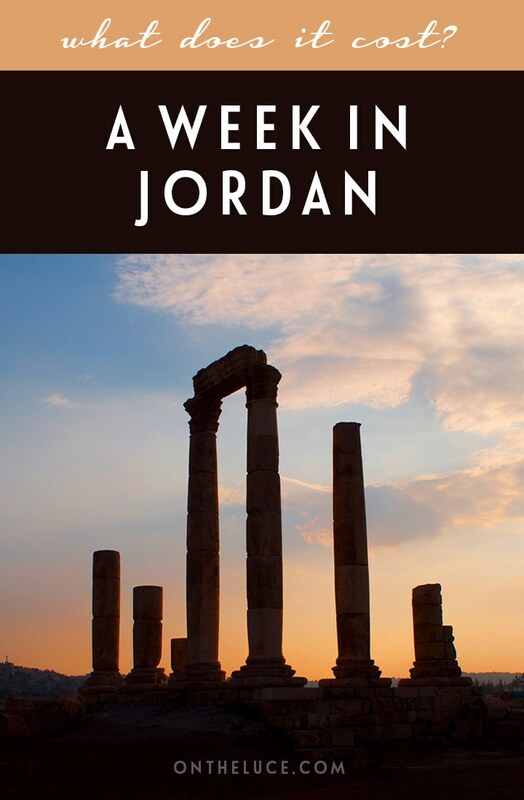 The overall cost for our week in Jordan came in at £589/$779 per person. This works out at about £84/$111 a night each, not including flights. One thing we didn’t have chance to do was the overnight camping trip in Wadi Rum, but you could add that in for around £50/$66. Lower budget? 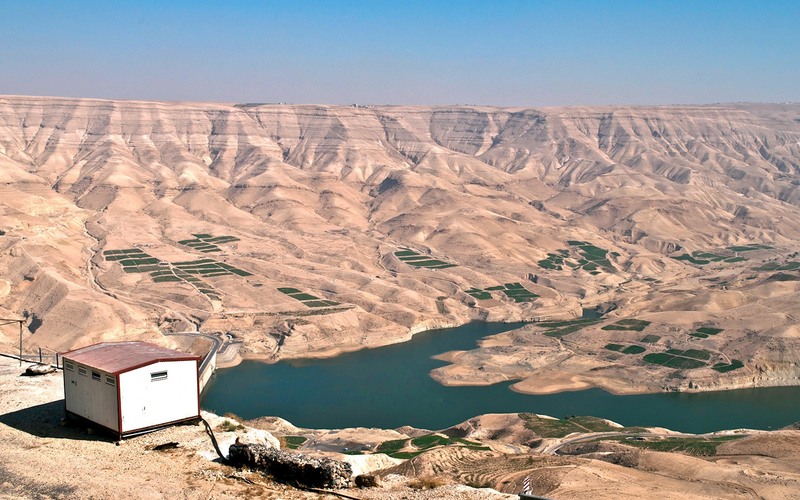 You could save money by visiting the Dead Sea on a day trip from Madaba or Amman rather than staying overnight as there isn’t much budget accommodation around. You could also save by using the public buses instead of hiring a car and by steering clear of alcohol! Higher budget? If you want to splash out, then you can stay right next to the entrance in Petra at one of the luxury hotels like the Movenpick or the Crowne Plaza. You can also hire a driver to get around rather than driving yourself, or spend some time in the Dead Sea spas. Great summary. Just one year ago, I was in Jordan, too. We combined a four-day trip to Jordan with a 9-trip to Israel. We were with a small group (Education Tours-only five of us went to Jordan), so we had personalized guide serve. I loved Jordan (though Amman’s traffic was truly horrendous), especially Petra and Jerash. This trip was one of the highlights of my life. That sounds like a great trip, I’d be really interested to visit Israel too. I was also in Jordan last summer for an Amman-based project. I also recall the horrible traffic. On a free weekend I booked a car and headed to Petra. One things that really stuck with me – my guide in Petra said to me that Americans get scared about coming to Jordan because of all the other crazy things happen in the world…and yet here lies such beauty that they are desperate to show off. Great post! I think a lot of people lump the whole of the Middle East in together as one place but the different countries vary so much. I found Jordan to be really safe and the people were so friendly and welcoming, I hope too many people don’t get discouraged from visiting. Gorgeous isn’t it – the £28 a night guesthouse had a huge balcony all around the front looking out onto that view, definitely one of my best travel bargains! What a great post! Very very useful in terms of information and also to demystify how expensive it is to travel and visit Petra. Thank you, it does have a reputation as being pricey but it really was good value for the amazing sites you can see. Useful information. My friends were in Jordan and visited Petra. They just spent less than a day and then moved into Israel. I was told that you need to walk a lot and is not suitable for elderly travellers. Is that true? I did a bit more of a comprehensive guide to Petra here (https://www.ontheluce.com/2013/01/21/a-first-timers-guide-to-petra/). But generally would say that Petra is a huge site, but there are transport options if people are able to get up onto a donkey or camel. There is also the horse and carriages from the entrance down to the Treasury so even elderly people who can’t walk too far would be able to get that far and see some of the most famous ruins. I love your budgets, Lucy! You do such a good job of keeping a trip reasonable while not missing out on the important things. I have not been to Petra, but will refer back to this budget guide if the opportunity presents itself. Thank you, I try to keep a balance and get the best value I can, but I’m definitely not of the self-deprivation school of travel! I’ve never been there, but I’d love to go. Thanks for your tips! It’s a really amazing place, well worth a visit if you get the chance! Thanks Suzanne, it was nice to revisit it even if it was just by writing this – could do with some of that warmth now! I always have to have a few luxuries in there somewhere! Thanks – Jordan is such a photogenic place, I loved taking pictures out there. 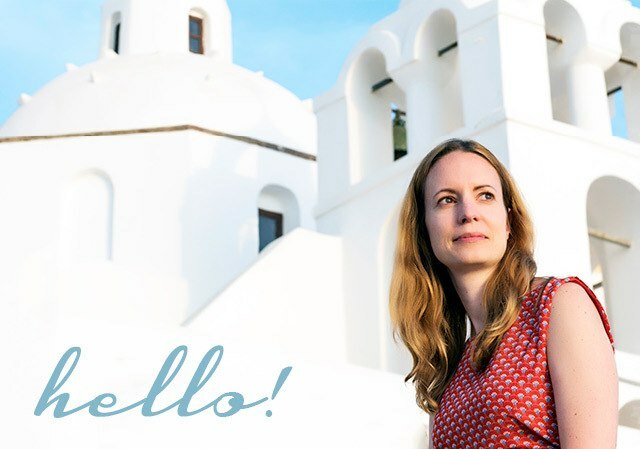 A really interesting way to talk about a trip – while you were laying out the budget I gained a lot of great info! Great pics too, thanks! Thanks – it’s interesting to go through it all after a trip to see if the reality matched the plan! 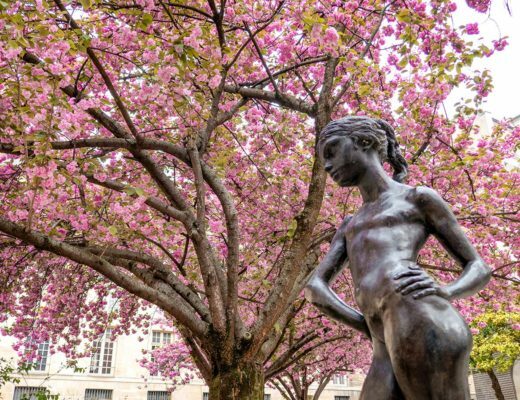 In the process of planning a trip there in the next few months but I’ve been struggling to find a realistic budget, thank you so much for the tips! That’s great – hope it comes in useful and that you have a fantastic trip! Love it Lucy, thanks. I found this post a massive help in planning a potential trip to Jordan in March. How did you find the driving in the highway out of interest? Great – hope you have a fantastic time, loved Jordan! Driving wasn’t too bad – bit chaotic in the cities and would definitely say get a sat nav, especially if you plan to drive through Amman as it’s a bit of a nightmare. Outside the cities the roads were good, though lots of speed bumps all over the place. Recommend doing the King’s Highway down to Petra, it was a slower than the highway but the scenery was amazing and the roads empty half the time. Any more Jordan questions just give me a shout. hows the driving ? Is it crazy ? Also, when we buy tickets to Petra, is a tour guide included in the price? Hi Ramesh, the Petra ticket doesn’t include a guide, but you can arrange one at the Visitor’s Centre. The driving wasn’t too bad outside the cities, Amman itself is incredibly hectic and confusing so a GPS is a good idea, but in the smaller towns there was no problem. Hi Can anyone let me know if there is any public transport from Queen Alia Airport to Petra. Hi Desiree, it’s around a three hour drive from Amman to Petra and around 70 JD does seem to be the normal rate (for the taxi so less if there are more of you). The other option is the bus – the JETT buses (www.jett.com.jo) cost JD 19 return, plus you would need to get a taxi to their offices from the airport. I’m also planning the visit Jordan for 1 week for Christmas – New Year. 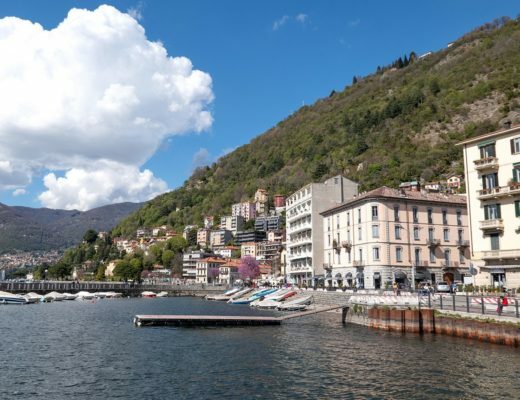 Your post gives a fair idea about the places I plan to visit. We do not plan to hire a car and thinking of using the public transport / taxies which may not be very convenient. Hi Anand, I heard that the buses are pretty good (see http://jett.com.jo/ for more info) and if you are travelling in a group it’s good value to hire a taxi and driver. Hope you have a great trip! Hi Lucy ..Is it safe to drive out there..
Hi Dazzle, we drove from Amman to Petra and back via the Dead Sea and had no problems at all – the roads are fine (though there’s a lot of speed bumps in the towns so keep your eye out!). Would advise getting a GPS/sat nav if you are driving in Amman as it’s quite a confusing place, but outside of there it was easy enough with a map. Me and my friend will be heAding to Jordan pretty soon. It’s just gonna be us girls. I wanted to ask how safe is Jordan? How are the people there? Would you recommend is to take a tour group, rent a car or go by public transport?? We are on a tight budget and would love some input. 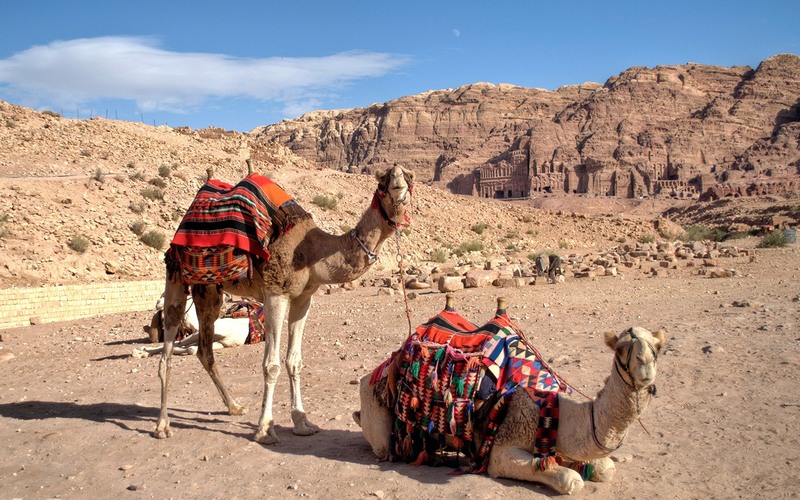 We’re thinking of heading to Petra, do the day and night tour before heading to wadi rum to stay in one of the hotels then touring wadi rum the next day. What do you think? What are other places do you recommend in Jordan?? Hi there, I generally found Jordan to be a safe place and the people very friendly – I would advise making sure you’re covered up and taking the usual safety precautions at night and with your valuables. We did it all with a rental car and found it really easy, and good to have the flexibility. Car hire wasn’t too expensive and gas is cheap. Your itinerary sounds good, though the night tour only runs certain days so you might need to check that, and it’s a lot of walking at Petra so can be pretty tiring. 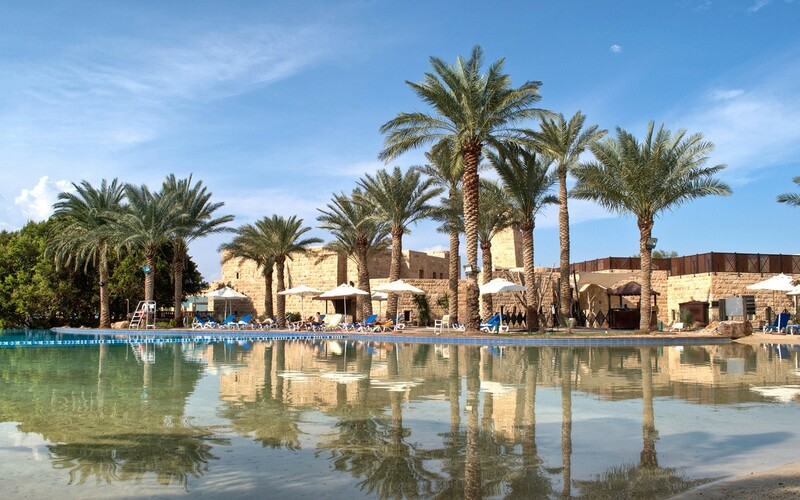 If you’ve got time the Dead Sea is worth a visit – the hotels can be pricey but you can easily do it on a stopover en route back to Amman from Wadi Rum or Petra. Have a great trip! Great post! Answered all my questions on whether or not Jordan would fit in my budget. Great to hear it came in useful! We just wanted you to know that we referred to your blog while traveling to Jordan last year and it came in quite handy. We found that a day trip ends up being costlier if you’re two people (around 100$) as opposed to a stay with free breakfast + beach access, something we wrote about on our blog too. Sound pretty good wish to visit …. Thanks, yes it was a great trip! When you buy petrol for the car, are you able to pay with a credit card ? 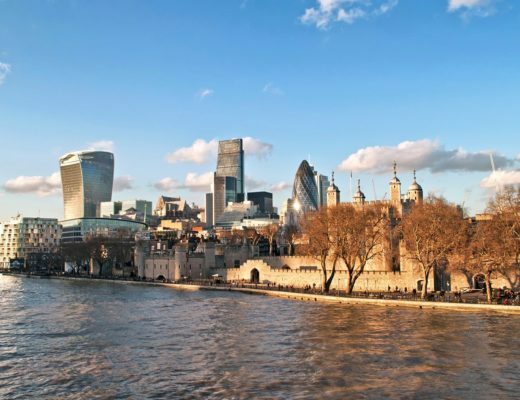 Could you pay entrance fees with a credit card or only cash ? Credit cards accepted in the larger supermarkets ? Thanks. Hi yes we found petrol stations, large shops and hotels all accepted credit cards. Since I visited you can now pay for entrance fees to Petra by credit card too, though it’s useful to have some local currency for drinks, snacks, tips etc. Hi Lucy, I can never find a flight from London to Jordan with easy jet. Even though I went into their official website so I ended up paying under £400 return with other airlines for my 15 days trip. 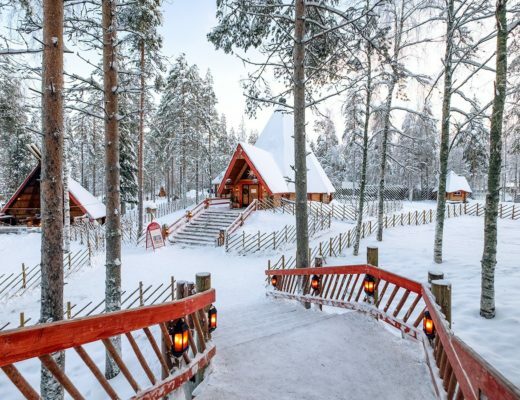 I’m a little anxious with the cost in terms of accommodations as I will be only female who’s travelling alone. Unfortunately it looks like easyJet isn’t running that route at the moment. 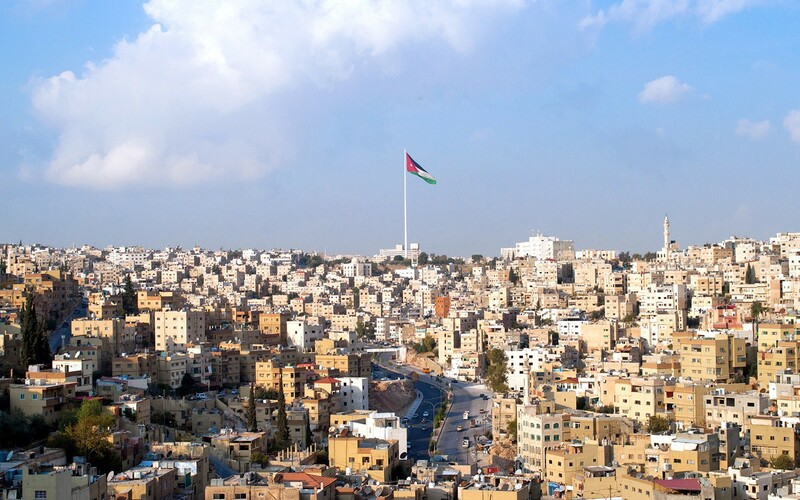 Accommodation is quite reasonable in Jordan though so it shouldn’t be prohibitively expensive being solo – there are some good hostels and budget hotels, Hostelworld is a good place to look for recommendations as they have a lot of reviews. Hope you have a great trip!